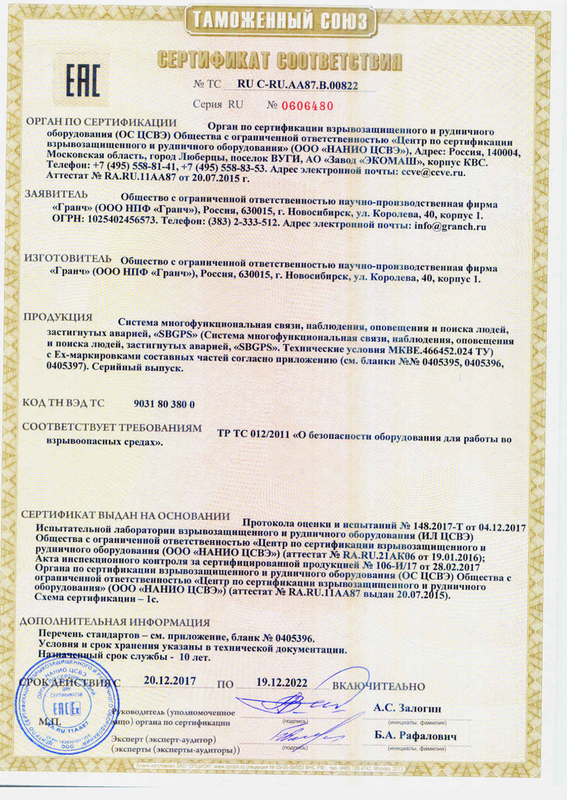 «SBGPS» system is a part of the «Smart mine» ® GORNASS. It is used to determine the location of personnel, transport and goods; determination of the speed and direction of movement of personnel and transport; Alerts (with confirmation of delivery to the addressee) and search for people caught by the accident; provision of personnel with mobile communication, transmission of video, audio and telemetry data from technical devices compatible with the system; dynamic control of hazardous and harmful gases and oxygen in the working area's air and signaling when their values ​​exceed specified limits; the use of navigation elements in the withdrawal of people from the emergency zones (sections) according to the emergency plan; operational control of the conformity of technological processes to specified parameters. The «SBGPS» system is used for the underground mines and their ground structures, which are dangerous for gas (methane) and / or combustible dust, in accordance with the Ex marking of the components. voice communication between underground personnel, with each other and with the dispatcher, and also with the possibility of access to the telephone network of the mine. alerting personnel in the danger zone.